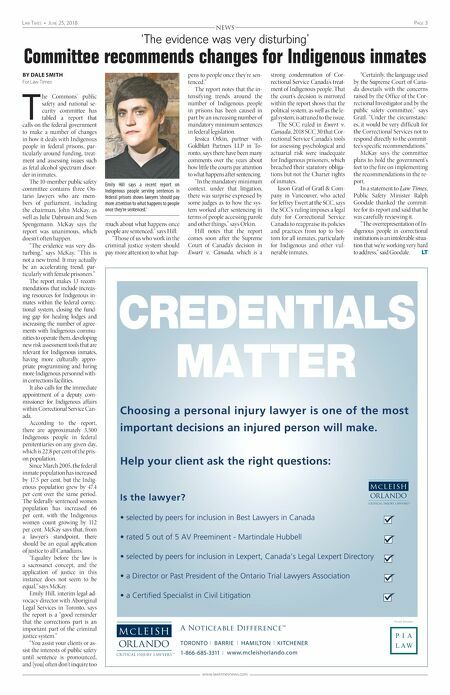 Page 2 June 25, 2018 • Law Times www.lawtimesnews.com The Divisional Court upheld the IPC findings last year. "The Order has a narrow fo- cus. It simply directs MAG to issue an access decision to the Requester. The head of MAG delegated this decision mak- ing authority to the Children's Lawyer. The Order does not re- quire the Children's Lawyer to produce privileged documents to the Requester," the court said. It rejected arguments that the Children's Lawyer is not part of the ministry when acting for child clients. The Divisional Court noted that litigation privilege exemp- tions from FIPPA are explicitly outlined in statutes such as the Legal Aid Services Act, but the legislature did not grant one to the Children's Lawyer. The Court of Appeal, in its ruling, found that a statutory ex- emption is not necessary. "When representing chil- dren, the Children's Lawyer op- erates separate and apart from MAG, does not take direction or obtain input from MAG, does not provide MAG with access to records relating to children and MAG does not have authority to request them," wrote Benotto. "Thus, the Children's Lawyer is not a branch of MAG for the purposes of the children's re- cords," she added. LT Advocates for the rights of children within the justice sys- tem are applauding the decision. "The Court of Appeal high- lighted the need to consider the best interests of the child in all circumstances," says Mary Bird- sell, executive director of Justice for Children and Youth, which was an intervener in the pro- ceeding. "It also clarifies that records belong to the child, the same way as in any other confidential file. Children should always have been able to access their files as a client requesting a file from a lawyer. This decision certainly makes that clear," says Birdsell. Jesse Mark, a staff lawyer with the organization who was its co-counsel at the Court of Appeal, adds that there are im- portant policy considerations in the ruling. "We are heartened to see the court's statement that the voice of the child is crucially impor- tant to a determination of what is in the child's best interests," he says. Jessica Gagné, a family and child protection lawyer in To- ronto, says the ruling attempts to address a legislative gap in terms of restricting access to records when someone is represented by the Children's Lawyer. "I think what is animating the decision is that the Court of Appeal looked at FIPPA and realized the exemptions would not cover litigation privilege," she says. "The legislation has not kept up with the developments and the role of the Office of the Children's Lawyer," Gagné says. She agrees that the ruling also makes clear that children have the right of access to their own records. "If it belongs to you, it belongs to you. I don't think the Children's Lawyer can refuse a request," says Gagne. In the case before the Court of Appeal, an adjudicator at the IPC ruled in 2015 that the Children's Lawyer was wrong to refuse even to issue an access de- cision on the father's records re- quest, only some of which were subject to privilege. As well, the adjudicator concluded that FIP- PA applied since the Children's Lawyer is a branch of the Minis- try of the Attorney General. alleges that banks "took active steps to conceal their participa- tion" in a scheme to fix prices in the foreign exchange market between Jan. 1, 2003 and Dec. 31, 2013. A group of entities related to UBS bank had already settled when, in July 2016, appellant Christopher Staines tried to add more institutions to the case. Staines' grounds were that UBS said that FX traders at TD and BMO were among par- ticipants in a conversation with more than 2,000 "collusive chats," according to the appeal. In most Ontario cases, in- cluding this one, an action must be started on or before the sec- ond anniversary of the day on which the claim was discovered, said Hoy, who wrote the appeal decision. The claim would have been statute-barred if they discovered it before July 20, 2014. The motion judge questioned whether TD and BMO's identi- ties could have been established if a meaningful investigation had taken place before time ran out, even with the late additions from UBS. Nonetheless, the plaintiff 's explanations should be given a "generous reading," Hoy wrote, citing Wakelin v. Gourley. Context must be considered when assessing whether a plain- tiff did "reasonable diligence" to find evidence, Hoy said. The fundamental issue the court was grappling with in this appeal was the meaning of "exer- cising due diligence" to discover a potential claim, says Margaret Waddell, founding partner of Waddell Phillips Barristers. "The error of the motions judge was in holding class coun- sel to an unreasonably high standard — effectively expecting them to function like a regula- tory investigator, and expect- ing them to take extraordinary steps," Waddell says. Given the appeal decision to add TD and BMO as parties, de- spite the time limit, the plaintiffs can go on to conduct discovery and dig further into the identi- ties of alleged participants in the conspiracy, said W. Fraser McDonald, partner at Allen Mc- Donald Swartz LLP. The entities affected by the appeal will be Toronto Domin- ion Bank, TD Securities, TD Bank USA, NA, T.D. Group Holdings, TD Bank N.A., Bank of Montreal, BMO Financial Corp., BMO Harris Bank N.A. and BMO Capital Markets Lim- ited. TD declined to comment, and BMO did not immediately respond to a request for com- ment. "The banks themselves con- ceded that even reasonable dili- gence on the part of the plain- tiffs might not have led to the conclusion that the banks were co-conspirators. This was a key point in the end as the Court of Appeal held that the plaintiffs can add TD and BMO to the list of defen- dants (and that the plaintiffs be entitled to costs as well)," says Anita Anand, a professor at the University of Toronto Faculty of Law. According to Koskie Min- sky, settlements of more than $100 million have already been reached with UBS, BNP, Bank of America, The Goldman Sachs Group, Inc., JPMorgan Chase & Co., Citigroup Inc., Barclays Bank PLC, HSBC Holdings PLC, Royal Bank of Scotland Group PLC, Standard Char- tered PLC, The Bank of Tokyo Mitsubishi UFJ, Ltd. and Socié- té Générale S.A. Settlements are not an admission of fault. Class action proceedings in- volving foreign and domestic firms that operate in Canada have been on the rise, particu- larly in parallel to U.S. cases. Lowering the threshold of evidence to add defendants and pushing diligence later into the process — as the appeal judge suggested in this case — might not be the most just and expedi- tious way to resolve class action conf licts given the inf lux of class action suits, says competition litigator Nikiforos Iatrou. "My read on this case is that it aligns with a trend — with an unfortunate trend — of consis- tently lowering the bar for plain- tiffs' lawyers in these kinds of class actions," Iatrou says. Alyssa Tomkins, partner at Caza Saikaley LLP, acknowl- edges that it can be frustrating for practitioners when there's less rigour early in the process, potentially stretching out the suit and piling on expenses for clients. But, she says, in this case, there is context around the par- ticular appeal decision that ex- tends beyond the trends within class action law. "I would say the appeal ap- pears correct. There is the reality of a representative plaintiff . . . to impose that level of burden on them would appear to be exces- sive," Tomkins says. 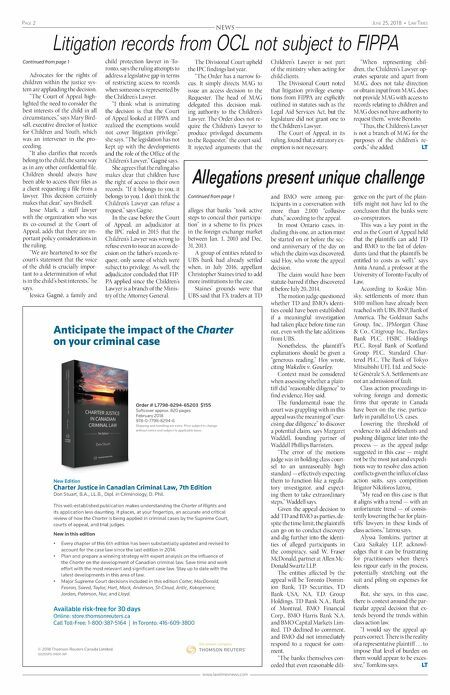 LT NEWS Allegations present unique challenge Continued from page 1 Continued from page 1 Litigation records from OCL not subject to FIPPA Available risk-free for 30 days Online: store.thomsonreuters.ca Call Toll-Free: 1-800-387-5164 | In Toronto: 416-609-3800 © 2018 Thomson Reuters Canada Limited 00250PS-91691-NP New Edition Charter Justice in Canadian Criminal Law, 7th Edition Don Stuart, B.A., LL.B., Dipl. in Criminology, D. Phil. This well-established publication makes understanding the Charter of Rights and its application less daunting. It places, at your fingertips, an accurate and critical review of how the Charter is being applied in criminal cases by the Supreme Court, courts of appeal, and trial judges. New in this edition • Every chapter of this 6th edition has been substantially updated and revised to account for the case law since the last edition in 2014. • Plan and prepare a winning strategy with expert analysis on the influence of the Charter on the development of Canadian criminal law. Save time and work effort with the most relevant and significant case law. Stay up to date with the latest developments in this area of law. • Major Supreme Court decisions included in this edition Carter, MacDonald, Fearon, Saeed, Taylor, Hart, Mack, Anderson, St-Cloud, Antic, Kokopenace, Jordan, Paterson, Nur, and Lloyd. Anticipate the impact of the Charter on your criminal case Order # L7798-8294-65203 $155 Softcover approx. 820 pages February 2018 978-0-7798-8294-6 Shipping and handling are extra. Price subject to change without notice and subject to applicable taxes.